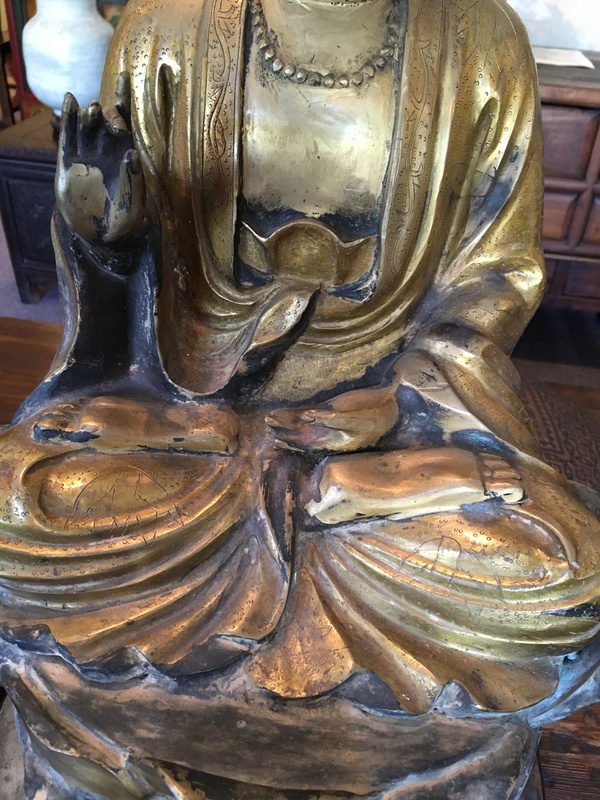 This bronze Kuanyin is seated in padmasana (lotus position), on a lavish tiered lotus throne, with hands in vitarkamudra (the gesture of giving instruction to believers), with a bottle holding the water of life resting in her left hand. When the hand is raised with the thumb and forefinger in the action of pressing together, it symbolizes wisdom and compassion, while the three raised fingers represent the triratna: The Buddha, The Dharma, and The Sangha. With these mudra (hand position), the Kuanyin is offering believers her help. This Kuanyin exudes an air of serenity and divine majesty. Her gilt bronze face has a “bindi” on her forehead (spiritually means to reach supreme goal of self-realization). Her hair is drawn up high into a bun, which at places shows a blue tint against the coppery hair due to oxidation of an alloy in the metal from aging. She is wearing a lavish dark coppery hooded robe with incised floral designs, which covers the high bun on her head and cascades down in crisp folds around her body, falling open to reveal the upper part of her bejeweled gilded bronze chest. A bronze areola of flame, a mandala (which literally means “a ring of fire”) is attached to the figure’s back but can be detached. Fire in Tantrism means knowledge. Without knowledge there is no possibility of arriving at self-realization. The mandala is tinted blue due to oxidation of an alloy in the metal from aging. It also shows some slight scorch marks. It is possible this statue coming out of China was rescued from a temple burned down during the Cultural Revolution. 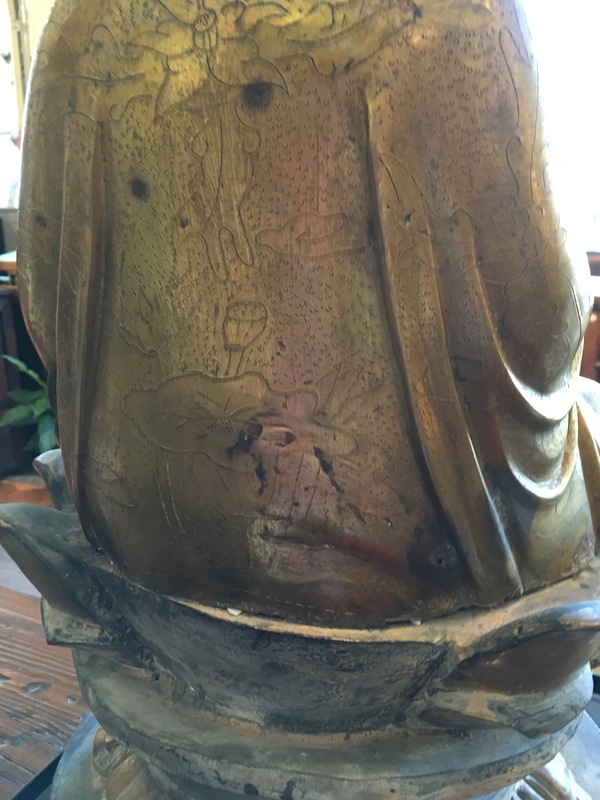 This Kuanyin has an unblemished gilded bronze visage, upper chest, exposed hands and feet. This is because these parts are made of brass, which has alloys of copper and zinc and shows a golden color, whereas the dark coppery parts are of bronze, with a high concentration of copper (88 percent) and typically 12 percent of tin. The zinc has an oxide that flakes off so surrounding base metal gets coated with it and with passage of time, causes oxidation and “rust”, a process known as “galvanization”. The mandala, as well as the lotus throne the figurine sits on, turned a bluish color due to this process. The golden features of the figurine against the dark coppery background brilliantly thrust this Goddess of Mercy and Compassion into her rightful position of prominence. Copper is a high value alloy. 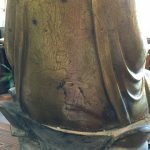 The high concentration of it in the robe means this statue is of relatively high quality. 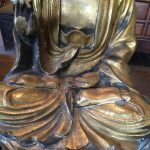 According to an article by the curator of the Phoenix Art Museum some time ago, antique Buddha figures are hard to find today as most are already in private collection or in museums.